5 Reasons Waimea Valley on Oahu is Worth the Trip! If you’re visiting Oahu and staying in Waikiki, you may wonder: what could possibly be worth driving 2 1/2 hours to Haleiwa on the North Shore?! The answer is plain and simple: Waimea Valley, which boasts historical and archaelogical sites, an expansive botanical garden, and cultural attractions that will transport you back to the time when Ancient Hawaiians ruled the land. 1. You Get Your Money’s Worth: Once you arrive in Hawaii, you may notice that ticket prices to many attractions and sites are, well, NOT cheap. However, at Waimea Valley, $16 for adults and $8 for children ages 4-12 buys you an ALL DAY pass to the park. Yes, you read that correctly—ALL DAY. Day passes are valid from 9 a.m. to 5 p.m. If you take the paved path through the Botanical Gardens and Historical Sites up to the Waterfall area, the walk is 3/4 of a mile one way or 1 1/2 miles round trip. 2. 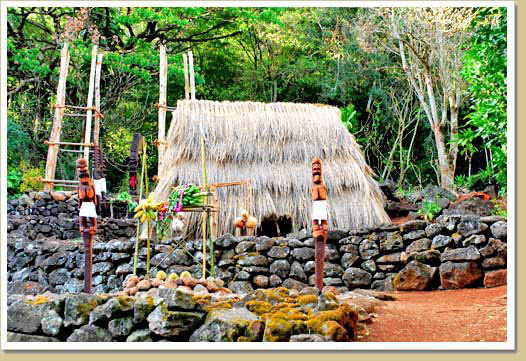 The Hale o Lono (house of Lono, a Native Hawaiian deity): As you stroll through Waimea Valley, make time to visit Hale o Lono, an ancient heiau (temple) dedicated to the deity, Lono. Hale o Lono located in Waimea Valley dates back to 1470AD and is the only fully restored Hale o Lono in the State. There, you can see the Hale o Lono, the Opu Tower, the Anuu Tower, Ahu (altar), Lepa (kapu sticks), and Na Kii Akua (sacred temple images). Originally, Hale o Lono were constructed and used primarily by alii (persons of high rank). Traditionally, food items are left as offerings at this type of heiau. Please do not remove pohaku (rocks) or leave items such as coins, incense, or candles as they cause long-term damage. Keep in mind, Waimea Valley boasts an abundance of Ancient Hawaiian Archaeological Sites: 78 sites of interest have been identified including religious sites and shrines, house sites, agricultural terraces and fishponds. The Hale o Lono at Waimea Valley is one of the only restored Hale o Lono's in the state. 3. The Extraordinary Botanical Collection: Waimea Valley is home to more than 5,000 documented kinds of tropical and subtropical plants including native and endangered Hawaiian plants. Enjoy the collection of heirloom varieties of kalo, sweet potato and banana, as well as one of the state’s most extensive collection of loulu palms, the only palms in Hawaii before Hawaiians brought coconuts. The diverse collection of plants is a display of over 1000 genera in over 200 plant families from all over the world in 35 separately-themed gardens. One is solely devoted to the Hawaiian hibiscus, and includes all three endangered subspecies of Hawaii’s state flower. 4. Cultural Activities Are Included: With your paid admission, you gain access to many of the site’s cultural activities, which will introduce you to Native Hawaiian culture. Activities include Hula Implement demonstrations, Hawaiian Games, and Crafts, Music and Story Telling with Kupuna(elders). 5. The Waimea Waterfall (also known as the Waihi Waterfall):An attraction of great interest and enjoyment is the Valley’s 45-foot waterfall. Waimea Fallsis approximately 3/4 of a mile from the Ticket booth. This is the only waterfall in Oahu where you can swim at that also has a changing room, life jackets available, and lifeguards on duty. 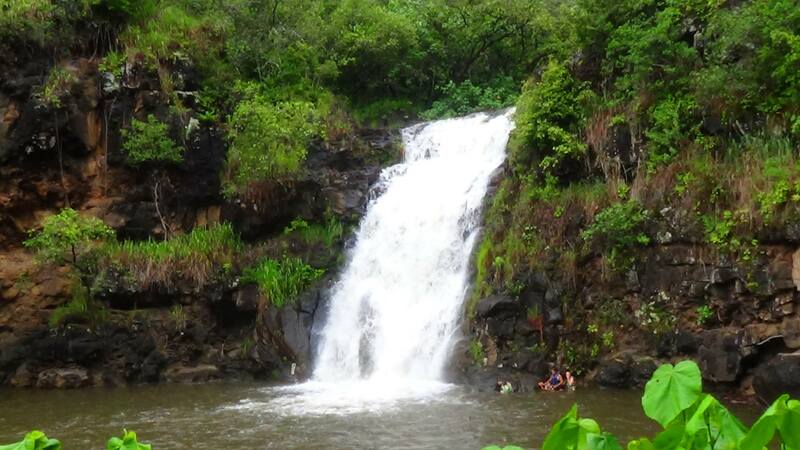 When you book a Fathers Day buffet and concert at Waimea Valley, your ticket comes with admisson to Waimea Valley, where you can hike to Waimea Falls. Waimea, “The Valley of the Priests,” has been a sacred place for more than 700 years, and the WaimeaValley park and cultural site does an outstanding job honoring this history, while also staying current and relevant for visitors. When you book your vacation through Hawaii Aloha Travel, be sure to mention you’d like to visit this extraordinary place. For more information, visit the site’s website at www.waimeavalley.net.